Extension education plays a major role in agricultural development. Timely and efficient dissemination of information on new technologies, crop production or pest management practices, and emerging or potential problems helps growers to reduce their production costs and improve yields. A variety of communication tools and techniques are necessary to effectively carry out the mission of extension education. As communication is a major part of extension education, the kind of communication tools used will determine the success of the program. Modern communication tools such as emails, webinars, electronic journals, social media, web portals, videos, and smartphone applications add value to traditional outreach methods such as field visits, phone calls, extension meetings, and field days. While the number of subscribers, views to online articles, or attendees at meetings indicates the effectiveness of the extension program, periodic surveys are very important to measure the impact. Here is an overview of my extension program and some of the methods used to reach out to my clientele groups since I joined UC Cooperative Extension in January, 2009. Field visits or individual consultations: They provide an opportunity to understand individual needs and provide specific solutions. More than 6,300 people have been served through personal visits or communication related to various crop production and crop protection. Field days and extension meetings: My annual extension events provide an excellent opportunity to bring together local communities where new information is exchanged and collaborations are developed. I have reached out to more than 5,800 people through various extension events organized by myself, my colleagues, or industry partners. Presentations and handouts from my meetings can be accessed online. Trade journals and web portals: Several print magazines and web portals such as American Vegetable Grower, American Fruit Grower, CAPCA Adviser, Growing Produce, Vegetables West, and Western Farm Press are excellent resources to disseminate information to thousands of readers. I regularly contribute article to these sources. Newsletters: Sending out periodical information through newsletters keeps the clients informed about new developments. Central Coast Agriculture Highlights is a quarterly newsletter that I sent out to about 500 subscribers. After finding out that other online articles are more effective in timely dissemination of information, I focused more on those options. However, I continue to contribute articles to county newsletters. Electronic journals: I started the electronic journal Strawberries and Vegetables six years ago (15 December, 2010), to alert growers about an issue that some of the strawberry growers were experiencing. Most of these articles are reviewed by peers and their periodic publication allowed immediate availability of information to people within the region as well as those outside California or United States. I started another electronic journal Pest News in January, 2011, to provide information about pests, diseases, and other issues not related to strawberries and vegetables. Out of the 80 articles in Strawberries and Vegetables, I authored or co-authored 74. These articles have a total of 173,120 direct views between 15 December, 2010 and 2016. While my 74 articles had 168,469 views, the remaining six had 4,651. On an average, each of my articles was read more than 2,200 times. 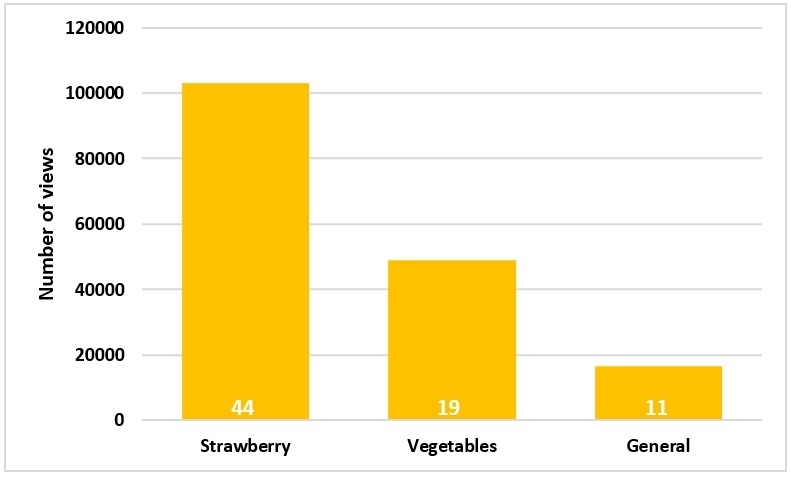 Readership of Strawberries and Vegetables eJournal related to specific crops or general issues from 15 December 2010-2016. Numbers on the bars are the number of articles. Number of articles (on bars) on different topics and their readership from 15 December, 201-2016 (above). Top five articles with the highest number of views (below). 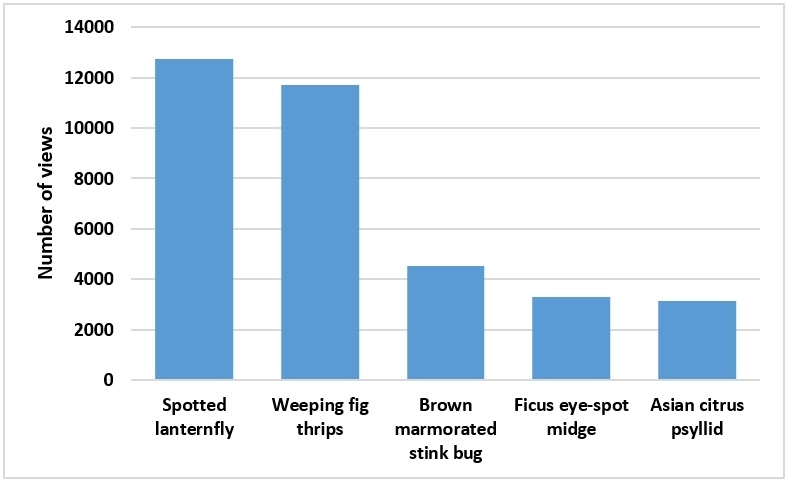 The average views for articles on strawberry or vegetable issues was about the same, but when the views or the readership of individual articles was considered, spider mite management in strawberries was the most popular topic followed by information on the invasive Bagrada bug. In Pest News the 16 articles I authored or co-authored were viewed 52,743 times since 2 February, 2011 while the 15 article authored by others were viewed 15, 264 times. Articles about the spotted lanternfly the weeping fig thrips, both invasive species, had the highest views. Top five popular articles in Pest News eJournal. Other extension publications: The illustrated strawberry production manual published in collaboration with Cachuma Resource Conservation District in both English and Spanish is available for free download. 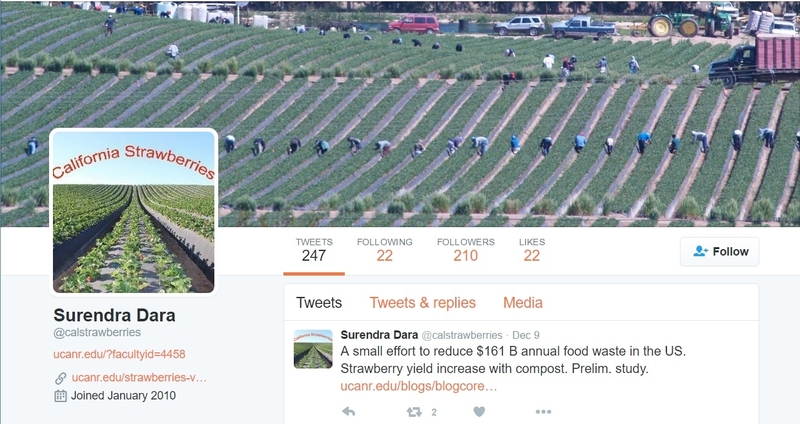 This publication complements contributions made to pest management guidelines or manuals published by UCANR. Smartphone application: Apps have become very popular because of the convenience and a variety of features or services they offer. 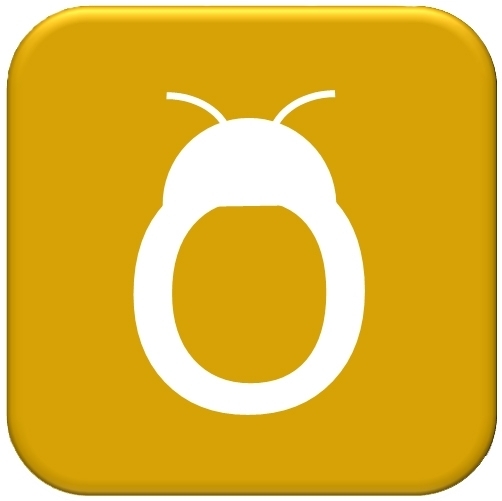 I conceived the idea of developing IPMinfo app three years ago to provide information about pests and diseases and had an Android version developed first for initial testing. An iOS version was first released in May, 2015 and with some improvements, the Android version was released in September, 2016. IPMinfo currently has information about strawberry pests and diseases, but additional crops will be added. With a few hundred downloads and very positive feedback from several users, IPMinfo, the first such app from University of California is an efficient extension tool using modern technology. IPMinfo can be downloaded through Apple App Store and Google Play Store for free. Twitter:Tweets are a great way to announce publications, extension events, or important issues in 140 characters or less. I started @calstrawberries and @calveggies accounts in January, 2010, which now have 210, and 149 followers, respectively. In addition to the followers, tweets from these accounts reach out to hundreds of other Twitter users. 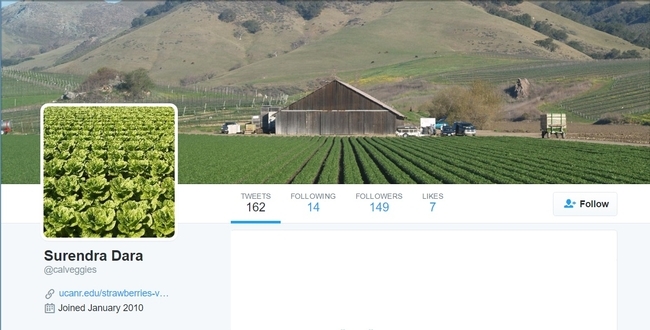 Stay tuned to the updates by following @calstrawberries and @calveggies. Facebook: Not having the character limit as in Twitter, Facebook allows us to post pictures and large text to engage clients in conversation about research and extension activities. I created the @strawberriesvegetables page in June, 2012 and it reaches out to those who are not connected through other tools. Like the @strawberriesvegetables Facebook page and stay connected. YouTube videos: A picture is worth a thousand words and a video is worth much more. Short videos are very valuable in providing information or training on a variety of issues. I first posted a YouTube video on the biology, damage, and control of the Bagrada bug on 1 August, 2013 in response to numerous queries about this invasive pest. On 23 September, 2013, I posted my second video on virus decline (Pallidosis-related decline) of strawberry. Both videos helped in providing a good overview of important issues at that time. Additional videos are also available on my YouTube channel. Informative short videos on pest and disease issues can be found on my YouTube channel. While there are several communication tools for extending information, it is important to evaluate the advantages and disadvantages of each and use them as appropriate for the program and the specific clientele groups. Needs assessment and impact measurement: Assessing the needs of the clients helps build a research and extension program that addresses existing and emerging issues. Conducting surveys immediately and a few months after the extension events helps understand their usefulness and impact in improving clients' knowledge, change behavior, or improving their agricultural practices. Surveys conducted after my extension events have been receiving positive feedback. For example, a recent survey showed that the information I provided through my research and extension program during last year positively impacted farming on more than 137,000 acres and improved savings or returns that amounted to $1.28 million. 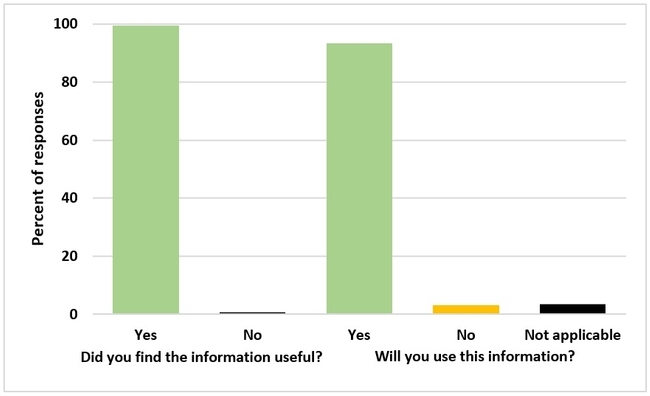 Feedback received from more than 300 people since 1 September, 2015 indicated that 99.4% found the articles in my electronic journals useful and 93.4% would use that information in their farming operations. Highly positive feedback indicates the usefulness of the information provided through the two eJournals. Acknowledgements: Thanks to all the growers, PCAs, industry partners, and other clients who support my research and extension program and continue to provide feedback enabling me to improve and serve better.